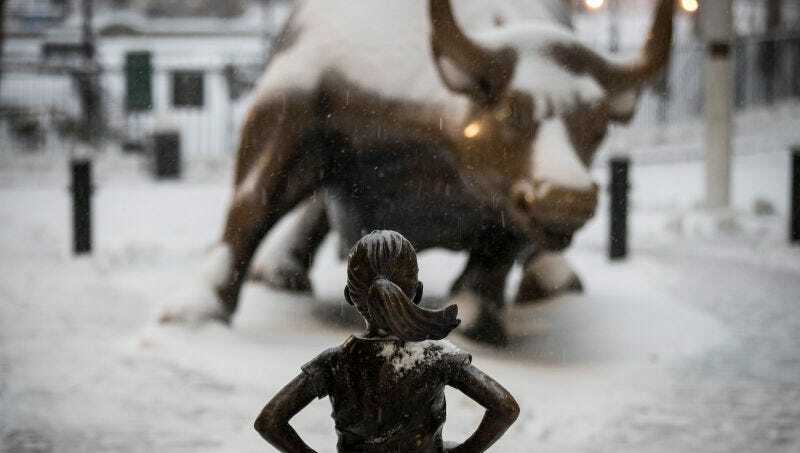 The investment firm behind Wall Street’s much-maligned Fearless Girl statue, theoretically erected to push companies to hire more women to top roles, has agreed to pay $5 million to settle allegations that it discriminated against hundreds of female executives by paying them less than their male counterparts, Bloomberg reports. State Street Corp. has agreed to pay out the sum to more than 300 women after a U.S. Department of Labor audit discovered that those employed as senior vice presidents, managing directors and vice presidents made less in base salary, bonuses and total compensation than men in similar roles since at least December of 2010. State Street’s own leadership team is 82 percent male and almost entirely white, and when the time came to hire more executives to its ranks this May, it went ahead and hired more men. Maybe they should think about relocating that Fearless Girl statue to a place closer to its own offices, where its message might be better internalized, like next to the urinals.